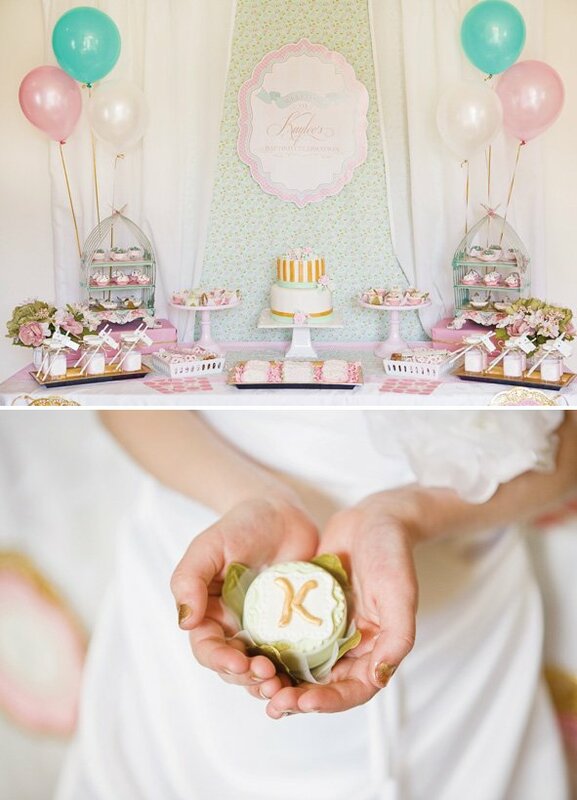 With pastels, florals, and absolutely stunning desserts, Jen Carver of Banner Events beautifully styled an Elegant Shabby Chic Baptism Dessert Social in honor of her daughter’s baptism. Stunning custom printables by Anders Ruff Custom Designs and a gorgeous pink, mint and gold cake by Christina Goff of 4 Kids Cakes made this sentimental occasion absolutely perfect! P.S. 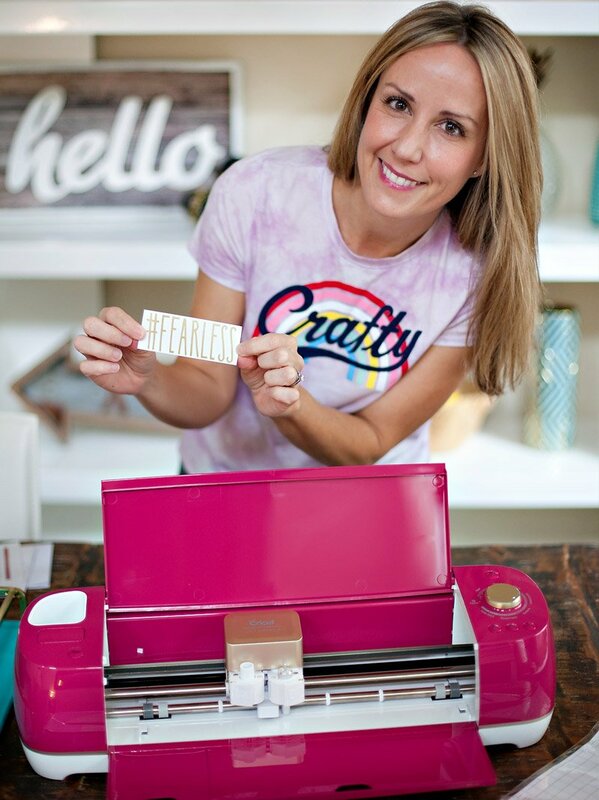 Jen also shares wonderful tips on incorporating printables into your party in her details below! My sweet daughter turned 8 in March. Eight is an important age in our church as it is the age children can choose to be baptized. Of course, as parents we wanted to support our daughter in this decision & celebrate her day. I hope you will enjoy the photographs, beautifully captured by Karina Rigtrup of A Fresh Take Photography. We had been preparing her for this day for a long time. She picked out a special white dress to wear. Professional photographs were taken. We talked about the religious ceremony and responsibilities. A guest list of family and close friends was created. What I wasn’t expecting was the lack of religious themed invitations & coordinating printable packages available online and in stores. 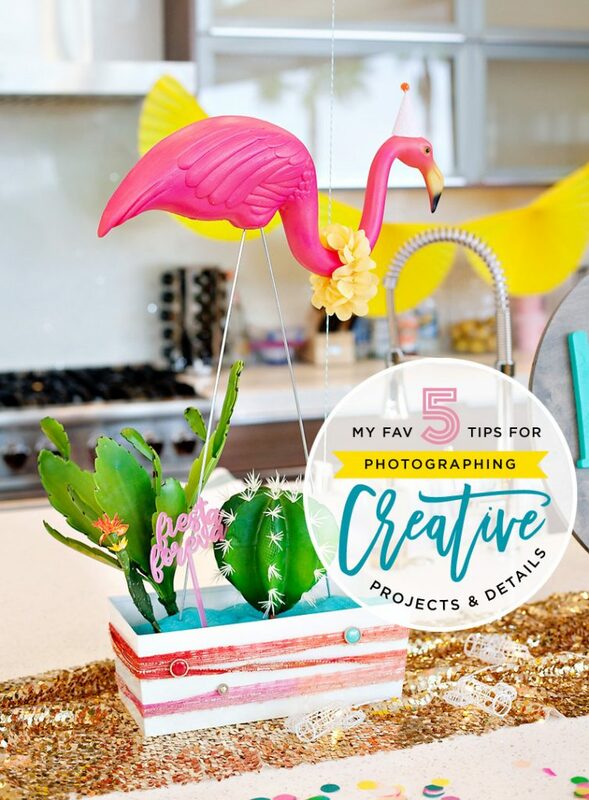 I was so grateful and thrilled when Maureen of Anders Ruff Custom Designs agreed to take on the challenge of creating fresh designs for for me from scratch. I gave her very little direction, but asked that it be elegant, incorporate beautiful shades of gold, mint, pink & blush with a trellis pattern, stripes and some gorgeous frames & scroll work. 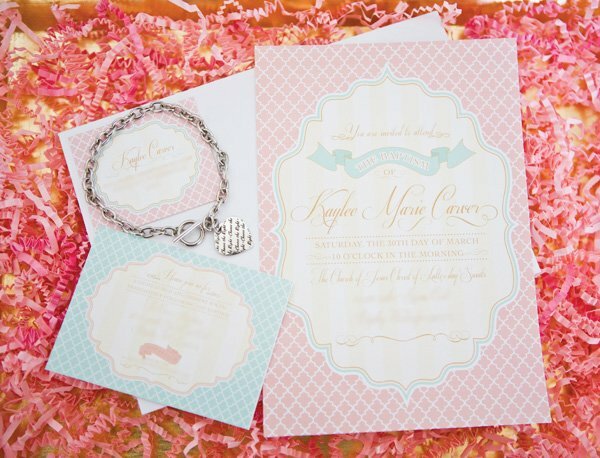 I absolutely adore what she designed and think you will too! As with many important life events, I knew the baptism day would be hectic getting a house full of people ready in ‘Sunday best’ and to the church on time. 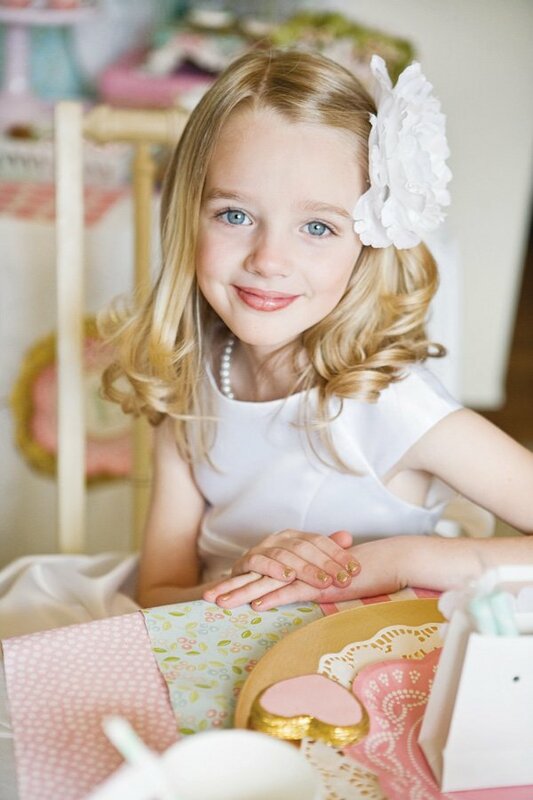 In my planning, I was hoping to minimize the chaos of the day by working ahead on my setup, allowing for a peaceful morning & a memorable day for my daughter and guests. 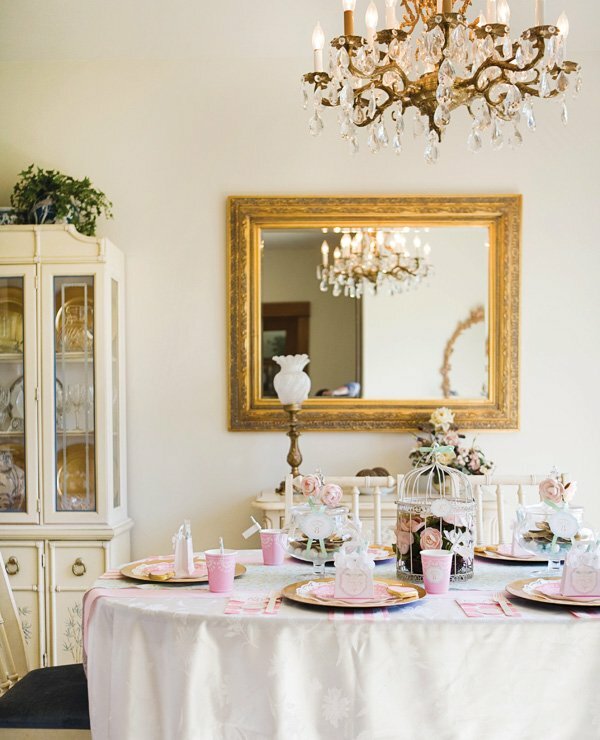 With the help of Anders Ruff’s stunning design work and by enlisting some of the most brilliant dessert artists, I was able to put together a beautiful dessert table & dining table for our social with just a few days of prep work. 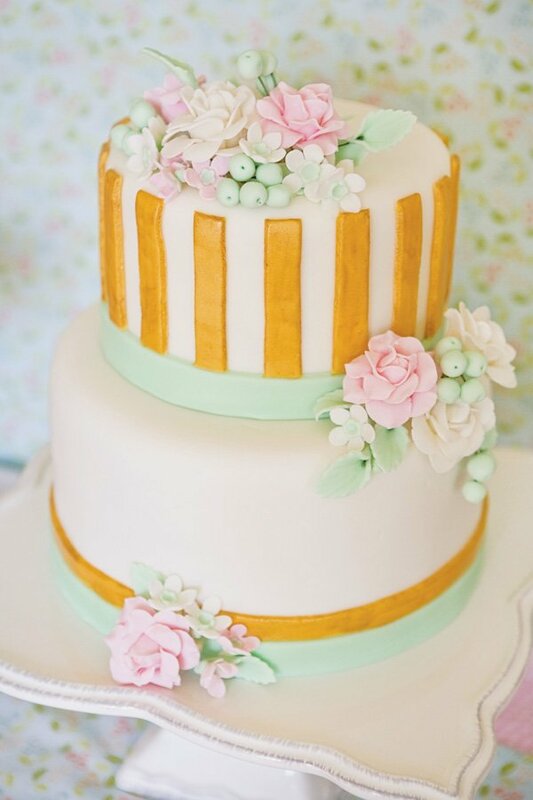 This gorgeous chocolate mint cake was created by the talented Christina Goff of 4 Kids Cakes. Christina’s cakes are beautiful and delicious. Double threat! I tell all of my guests to save their diet ‘cheat days’ for Christina’s cakes! 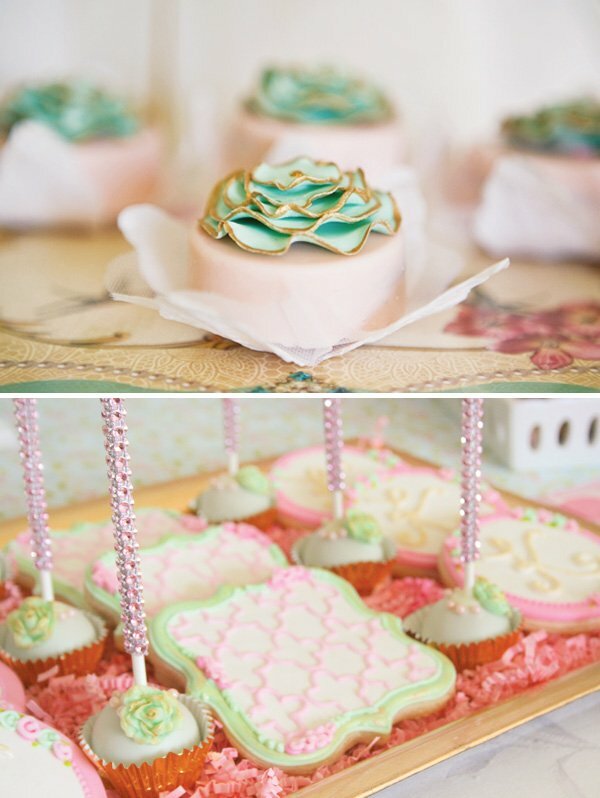 I love the delicate flowers (all edible!) and the gold shimmer detailing! 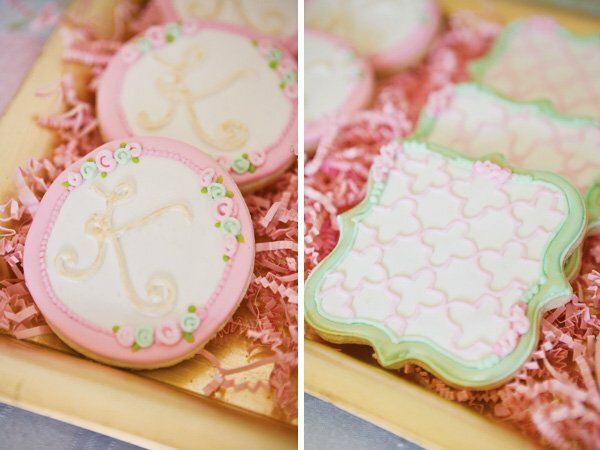 We loved the breathtaking cookies designed by Jen of Sugary Sweet Cupcakes & Treats . The delicate floral details, monogram & trellis patterns coordinated beautifully with the printable elements and color palette. Lovely and delicately embellished cake pops by Maskipops by Adri and delicious rose macarons by Felt & Flour were paired with stunning chocolate fondant Oreos from Earth & Sugar making a beautiful display. 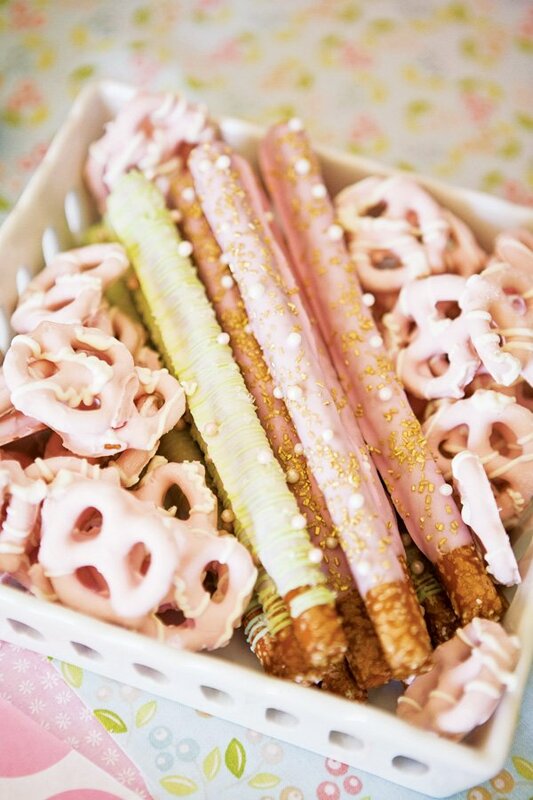 Chocolate covered pretzels are always a popular dessert table choice, and their shelflife is long, allowing them to stay fresh for weeks after an event. We love the edible pearl accents and gold sparkles Berry Delish added for an extra glamorous look. 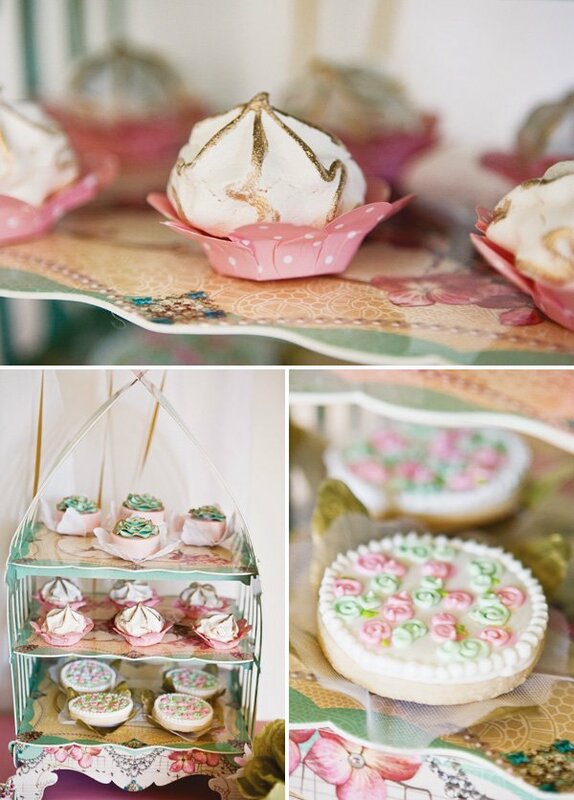 I adore the intricate tiered bird cage stands from Via Blossom, as well as the pretty gold, white & pink polka dotted dessert cups that made reloading the dessert stand so easy. Don’t those gold dusted meringues from The Sweet Tooth Bar look amazing? And while it was so hard to eat something so beautiful, Maria’s Love & Sugar chocolate fondant covered Oreos were a hit! 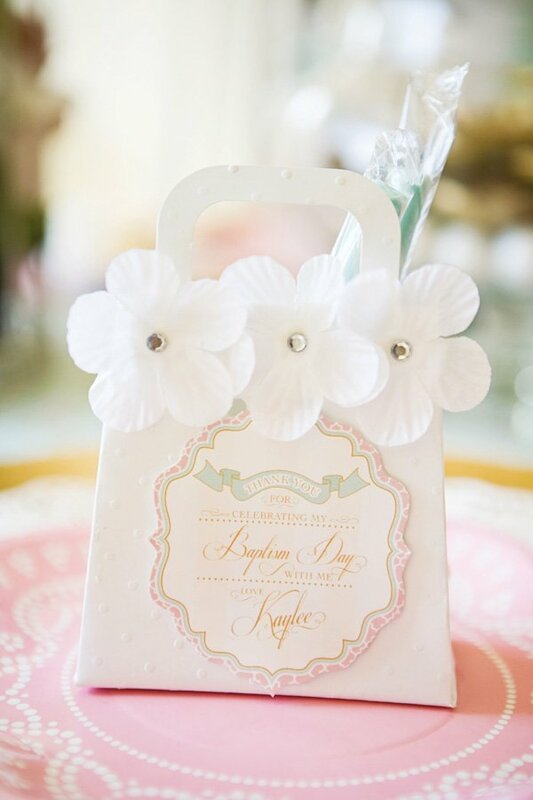 I wanted to keep the place settings delicate to match the simple beauty of a sacred day. 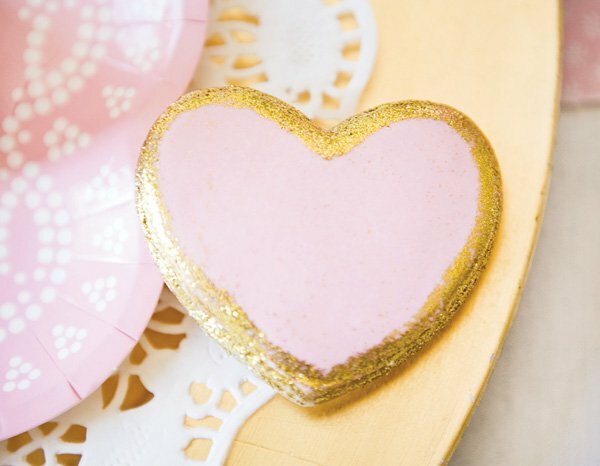 We used SmashCake Studio’s beautiful paper plates layered on paper doilies and gold chargers and accented each with a pretty gold tipped cookie from The Sweet Tooth Bar. – Invitation & return address label (+ enclosure card depending on event): I feel having a gorgeous invitation suite is the first essential detail of every successful event. Anders Ruff always does a beautiful job of pairing impeccable design work with a stylish color palette suited to your specifications, classic patterns & trendy design elements. 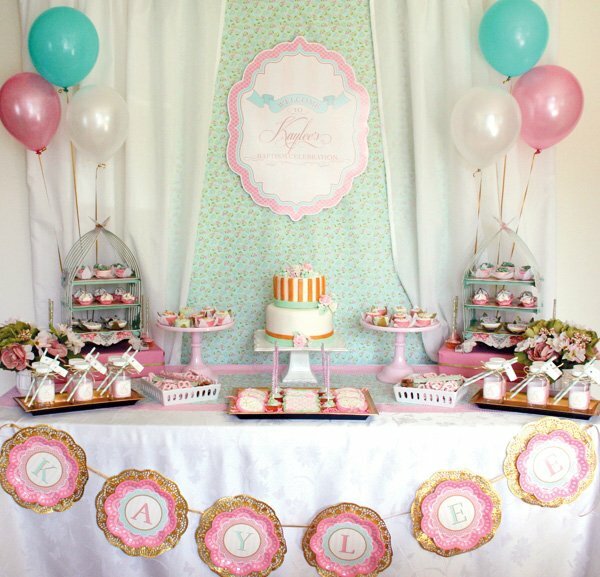 – Banner/Bunting: Banners & bunting come in a fun variety of shapes & sizes. I love using them to recognize the guest of honor by incorporating his or her name or highlighting the occasion with something like “Congrats” or “Happy Birthday”. It is a simple & inexpensive piece of party decor with big impact. 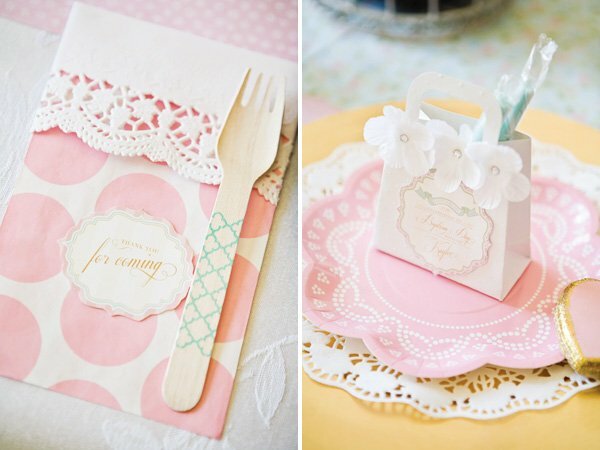 To recreate our look, layer the printable scallop banner on top of beautiful pink lace paper plates from SmashCake Studio and gold lace doilies from Party City. 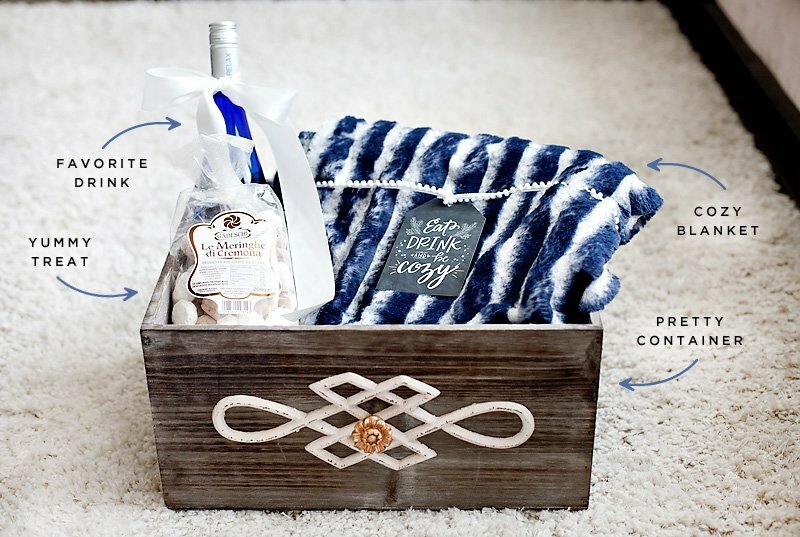 – Beverage wraps: I adore beverage wraps! They can be added to square french plastic bottles like those seen here from SmashCake Studio, to glass mason jars, milk bottles, cans & bottles of soda pop or water and even paper cups. Usually 5-6 print per page, making them an affordable way to dress up your beverages & add some coordinating details to your event. 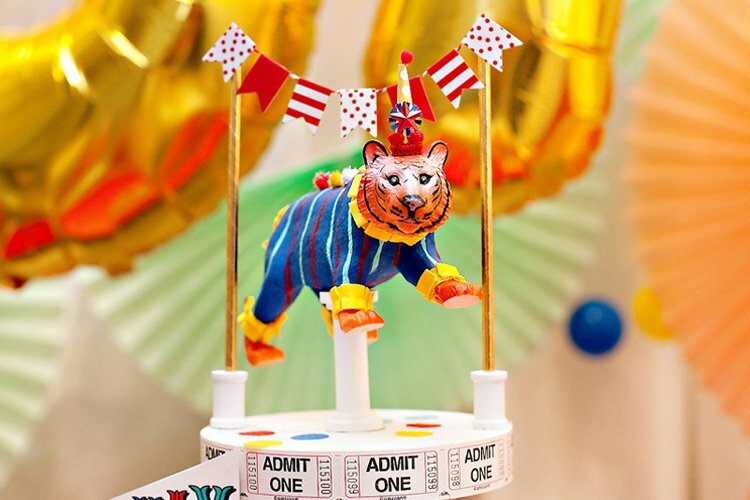 Plus, I love that you can personalize them with the name of your guest, special details pertaining to the event and even fun elements from your event theme. Easily attach them with tape, glue dots, a glue gun or your favorite double sided adhesive. –Favor tag(s): Perfect for dressing up favors and take-home treats! – Straw/dessert stick part flags: O.K. party flags might not be “essential”, but they are almost always on my printable “wish list” because they are such a fun detail! 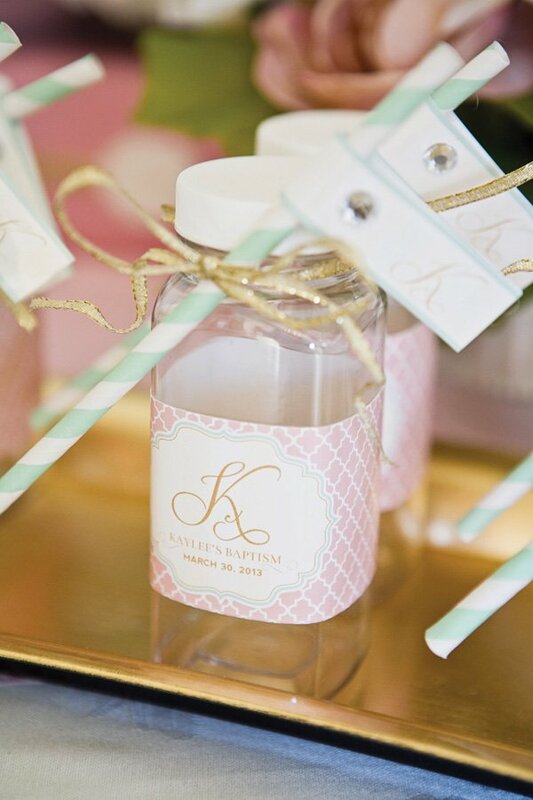 Add them to straws, sucker sticks, cake pop sticks, flower stems, candy, etc… with a little personal note or event detail. Our party flags came in 2 versions. One had a congratulatory sentiment and the other had a monogram K to honor our guest of honor. – Optional: Backdrop Centerpiece sign: I love a beautiful sign welcoming friends to my events. 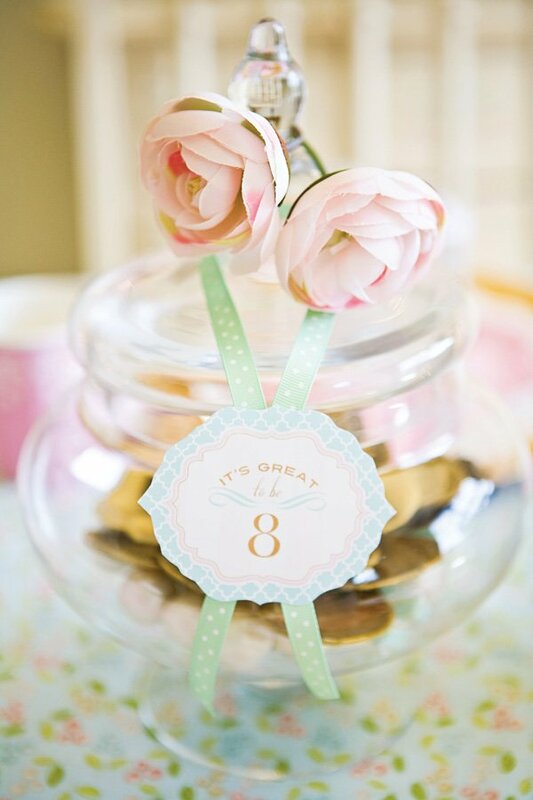 It can serve as a focal point for a dessert table or a greeting on a front door. Either way, the fun shape of this sign was just what we needed to tie our event together. TIP: Print poster size (20x 30″) at Costco for less than $10! This is simply stunning and elegant. 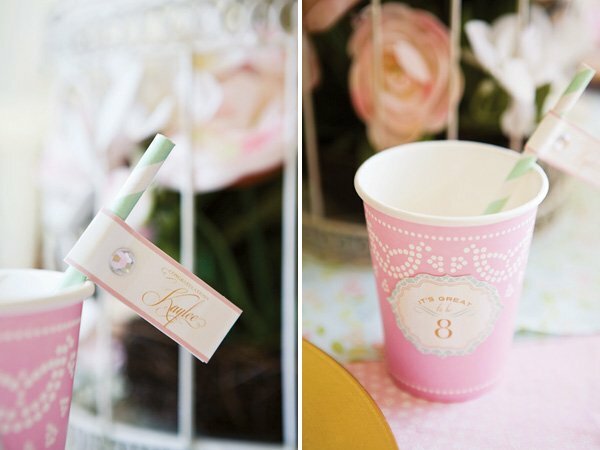 I love the colour scheme and all the details. Well done! This looks just beautiful! The attention to detail is amazing! 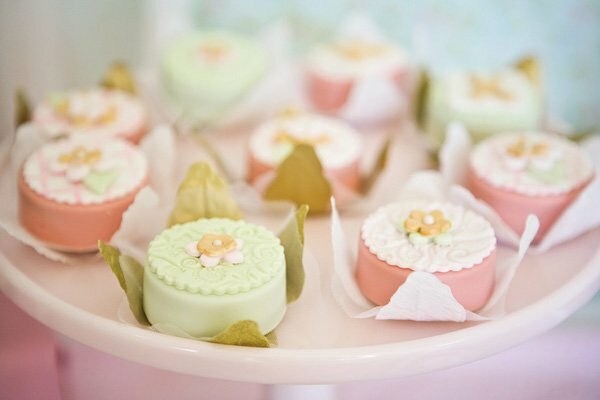 Everything is beautiful, where can I find the white favor boxes? 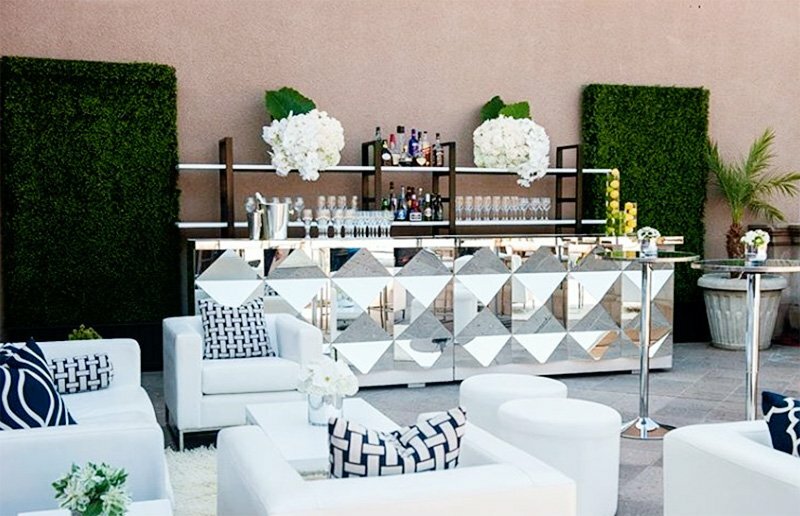 Just viewing party idea pics & wanted to compliment you. So many beautiful images to be inspired by. Thanks!